Treasury bills, certificates of deposit, mortgages, stocks I bonds, real estate — the complicated vocabulary of our modern money system seems hard to master. And new money-making schemes are constantly being dreamed up. It seems almost every conceivable way of making one's money stretch and grow has been tried. Everyone but one I that is — the very one that the Bible, God's instruction Book for man, proclaims as the true investment vehicle for financial peace of mind! That virtually untried system is tithing. The very suggestion that modern man should tithe strikes most as laughable. But isn't it strange that the bonds of a human government millions of dollars in debt make sense as an investment, while the tithing system of the God who created and owns everything in the universe is treated with scorn? Should tithing be treated scornfully? Is it passe? Or is it a command and a financial law that we must observe today? You need to know, for Malachi 3:8-10 pronounces a blessing on those who tithe and, conversely, a curse on those who won't. If tithing is for today, that blessing or curse is for you! To tithe means to allocate one tenth of one's income to Christ for His Church. Tithing has always been God's financial system and continues to be a binding obligation upon New Testament Christians, to whom blessings are promised for tithing and curses for refusing to do so. Of course, the law of tithing finds precious little support even in religious circles today, to say nothing of financial advisers who would openly laugh at the idea. Many, though not all, religious leaders proclaim that we need not tithe, giving as we are able, saying that the New Testament just requires giving as we are able. Some say tithing was just for the Jews, or that the law of tithing was done away with the passing of the Old Covenant and the law of Moses. Others maintain tithing was only a civil matter even in Old Testament times, and the existence of civil tax codes negates the need to tithe today. Others say the tithe was only to help the poor and that our modern welfare systems take its place. Still others say they believe in tithing, but conclude that the word simply means giving money to the Church in whatever amount one chooses. Many of these beliefs may be well intentioned, but all of them are proven wrong by plain biblical evidence. "The mind of man is selfish, and thus swayed, by covetousness, not to believe that one should give anybody — even God — a tenth of one's income. Most often this selfishness is framed by the argument that says: "I've worked hard for my paycheck and the money is mine! Why should anybody be able to tell me what to do with it?" But this argument is fallacious. We make money with talents God gives us, with a life He gives us, with elements from the earth He created and owns. God says plainly in Job 41:11, "Everything under heaven is Mine." And in Psalm 50:12, "The world is Mine, and all it fullness." We are guests blessed with the privilege of living here and using God's beautiful earth. So our money is not really ours! And why should it seem wrong for God to command that we tithe our income to Him? Even the governments of this world make prior demands on our income in the form of taxes, and we quickly agree with their right to do so, if not with their means or amounts. The place to begin for this topic is to define the word tithe. It means an exact tenth of something. As used in the Bible, it refers to allocating one tenth of one's income to the Work of God's Church. It does not mean simply giving in a general way. The crux of the tithing doctrine is simply this: The only financial system for the support of the Church commanded, illustrated or even referred to in the entire Bible — in both Old and New Testaments — is tithing. No other overall financial system is recognized. The Church is not authorized to charge for its services, nor is it put into the position of having to beg for money. Abraham tithed to the priest Me1chizedek long before the children of Israel were ever given the tithing law (Genesis 14:18-20). Tithing was commanded of the Israelites in later centuries as God's chosen method of financing the priesthood (Leviticus 27:30). The prophets denounced those who would not tithe (Malachi 3:8-10). Tithing was the recognized system during Christ's time (Matthew 23:23). The apostle Paul proclaimed that God's ministry should receive the tithes of the people in the New Testament era of the Church (Hebrews 7:4-14). Those who oppose tithing cannot turn to Scripture to support any supposed substitute. So what men have instead tried to do is frame counter arguments against tithing in an attempt to say it was done away. One such argument against tithing states that we need not tithe today since we are bound to the spirit of the law and not the letter. For proof, some will turn to II Corinthians 9:6-7, which seems to imply a person can give whatever he wants. But to obey the spirit of the law means to go above and beyond the letter, not to annul it. Therefore tithing is not annulled by the spirit of giving, but merely consigned to be the least a person must do. Another supposed reason why we need not tithe, critics say, is that tithing was only for the Jews. Of course, those who use this argument don't; even address 1) that the law God gave Israel was not just to the Jews, 2) that God said the law He gave Israel was full of wisdom and understanding (Deuteronomy 4:5-6) or 3) that we all must become spiritual Jews to receive salvation (Romans 2:29, John 4:22). But even in addition to these truths, it is plain that tithing was not merely for the Jews, since Abraham tithed to God long, long before God gave Israel His tithing law. Abraham was, of course, not a Jew, but was the father of the faithful, one who feared God and kept His commandments (Genesis 26:5), as should we. Tithing is not necessary, say some detractors, because it was part of the Old Covenant, and the Old Covenant is done away. True, tithing was indeed part of the Old Covenant. But Abraham tithed, and he lived long, long before the terms of the Old Covenant were instituted. What the Old Covenant did not originate did not die with it. 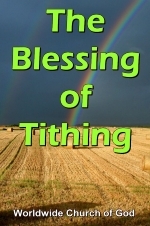 Rather, tithing was part of the Old Covenant because tithing is the system God has always used to finance His Work. Some who are uninformed will say tithing was purely a matter of civil taxation, or was only to help support the poor. They say that our government tax systems and welfare programs take the place of the tithe. But the Bible is clear on the matter. The first tithe was specifically for the support of the religious system and priesthood (Numbers 18:20-21). Finally, some will say that they do not tithe since it is "not commanded" in the New Testament. Again, this is a fallacious argument, and for numerous reasons. First, those who say such a thing are requiring, in effect, a direct "Thus saith the Lord" before they will obey God on any point. The Bible shows God's will on many doctrines without using that exact expression. Those who will not obey God unless He uses some magic words of which they approve plainly do not want to obey God, and will always try to find a way to justify not obeying Him, no matter what He says. It's as simple as that. Second, the New Testament does indeed clearly confirm the tithing law for us today. For example, in Matthew 23:23 Christ upbraided the pharisees for ignoring justice and mercy, but added that tithing (which they did do, albeit in a wrong manner) should not remain undone. Hence He confirmed the tithing law. Further, Paul spoke of tithing in Hebrews 7. Paul showed that the priesthood of Jesus Christ supersedes the Levitical priesthood of the Old Testament. We must tithe today! Hebrews 7:5 clearly labels tithing as a law. In summary, then, the law of tithing remains what it has always been — the only system of finance for God's Church that has ever been used, espoused or even referred to in the Bible. Genesis 14:18-20 — Abraham tithed long before Israel was commanded to do so. Leviticus 27:30 and Numbers 18:20-21 — Israel was commanded to tithe in support of God's religious system. Job 41:11 and Psalm 50:12 — God owns everything, even things we think are ours. Matthew 23:23 and Hebrews 7:4-14 — even after Christ's death, Paul called tithing, which was confirmed by Christ, a law. Malachi 3:8-10 — blessings for tithing and curses for not tithing. Yes, man in general has looked to every conceivable method of finance and money management, but has ignored the very system God ordained to finance His Church and bless His people personally. But God's Church today stands as a bright beacon, proving for all to see that God's tithing system works.